There were two challenges to overcome: the first was to sell consumers on a device whose purpose was not fully understood or considered essential. The second was overcoming concern about owning a gadget that listens, records and reports personal behavior to the company making it, which will then use that information. In a survey, many people said they ended up using smart home technology—in particular smart speakers—because they received them as gifts. Amazon and Google both slashed prices so low that they likely lost money over holiday smart speaker purchases. Those who already own one see the value in having it. 72% of smart speaker owners report using it as part of their daily routines and 45% said they plan to purchase at least one more smart speaker for their homes. Following blockbuster holiday sales, it’s official: Smart speakers are the new best-selling consumer gadget. According to data from independent technology analysis company Canalys, nearly 35 million smart speakers shipped in 2017. That number is expected to top 56 million this year. The U.S leads in sales, with growing adoption in Western Europe, too. Smart speakers, the Amazon Echo in particular, pose an attractive proposition. The voice-first device works with both iOS and Android smartphones and connects with a variety of other smart home devices. You can use it for basic queries, like the weather, news, or sports stats; use it as a streaming media player; or use it to control other connected devices around the home. While Amazon was first to market and thus has a leg up on home penetration and partnerships with third-party companies, it’s a space that every major hardware-maker is aiming to get into. Google has put in a big push to catch up with its Google Home suite of smart speakers. Apple, too, is entering the space with its audio-focused HomePod, a $350 device whose launch was delayed until sometime this year. But for many households, smart speaker adoption hasn’t been planned. It’s also followed a different trajectory than other gadgets like a new tablet or smartwatch, which you may hear about, read a few reviews on, and then decide to purchase yourself. In a survey conducted by Scripps Networks Interactive, many people said they ended up using smart home technology—in particular smart speakers—because they received them as gifts. While Scripps Networks’ survey didn’t detail the exact percentage of those who were gifted a smart speaker, the item was a hot topic in gift guides and buying guides this holiday season. One publication even called it “the best last minute gift you should buy.” Sales of Amazon’s Echo products, including its second-generation Echo speaker, the smaller Echo Dot, and the Echo Spot, spiked late in 2017, and the company said it had a “record holiday season.” In fact, in what proved to be an effective move to bolster sales, Amazon and Google both slashed prices so low that they likely lost money over holiday smart speaker purchases. The Echo Dot, Amazon’s top selling product for the period, sold for $30, compared with its normal $50 list price. The price of the pint-sized Google Home Mini was similarly slashed. These companies made a wise bet: That these devices would make popular gifts this holiday season, and lowered prices would bolster that effect. But a smart speaker, as a gift, isn’t like a Nintendo Switch or even a new e-reader. It’s a device that sits in your home and listens to what you’re saying at all times, on the off chance that it hears its wake word and is issued a command. Putting an always-on listening device in someone’s home is a big deal, and not everyone is OK with it. “The newfound privacy conundrum presented by installing a device that can literally listen to everything you’re saying represents a chilling new development in the age of internet-connected things,” Adam Clark Estes wrote in a December Gizmodo piece. If smart speakers are often being adopted as gifts, it seems to indicate there’s a disconnect. The public at large—those who don’t already own a smart speaker but could afford one—either don’t see the value in the purchase or are deterred by the privacy implications (or both). 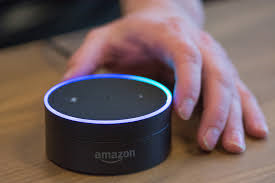 This likely had something to do with why the Echo took so long to gain mass market appeal: While Amazon announced the device in 2014, it took more than two years for people to begin adopting it in earnest. Now, those who already own one see the value in having it in their homes—72 percent of smart speaker owners report using it as part of their daily routines and, according to a separate survey, 45 percent said they plan to purchase at least one more smart speaker for their homes. It makes more sense then why they are willing to bestow such a personal, intrusive gift: They’re confident you’ll enjoy its value, too. And from the largely glowing reviews, they seem to be right. For those who’ve received an Echo or Google Home as a gift this season, you’ve got a new, useful way to learn information, control smart home accessories, and play music in your abode. And in slashing prices, Amazon and other smart speaker makers ensured you are among a record number of new smart speaker–owning homes. But while device profits may have been negligible, the information companies such as Amazon and Google will learn from our purchases and habits will more than recoup those losses—and it’s something you’ll likely forget about as you’re indoctrinated into the Alexa way of life.